The Pearl / Bullard / Eccles / Kabriski Mansion is one of the most important buildings left standing in Flushing today. Not only is this structure one of the oldest remaining buildings remaining in Flushing (and for that matter all of New York City), it is an almost unique example of a summer "cottage" built during the first wave of ultra-wealthy resort housing during the mid-19th century in the Town of Flushing. In 1839, the Long Island Railroad established a train station in what is now downtown Flushing. At that time, much of Flushing was still in the hands of the same families that had owned their lands for close to 200 years. As the center of the horticultural industry for the United States since the mid-18th century, many rare and exotic species were propagated in Flushing; with them, expansive and fanciful estates were constructed. The Pearl / Bullard / Eccles / Kabriski Mansion was constructed sometime before 1850 at a time when the very wealthy began to buy some of the nursery properties to develop summer "cottages" or estates. To the west, land originally owned by Nathan Sanford, then Chancellor of New York State, was developed into his country seat, Sanford Hall. To the south and east, almost all of the land was controlled by the Parsons family, at the time the largest landowners in Flushing with most of their holdings involved in the horticultural industry. Sanford Avenue, along with Jaegar Avenue (Main Street), Jamaica Avenue (Kissena Boulevard), Parsons Avenue (Boulevard) and Broadway (Northern Boulevard) were developed between 1840 and 1870 with grand estates, many of them only for summer usage. Little is known about the original owner, Charles Pearl, except that he was a prominent lawyer in Manhattan, originally from Poughkeepsie, NY. His daughter, Agnes, married Frederick A. Guild, in Flushing on June 2nd, 1869. Charles Pearl died in Flushing on August 9th, 1878. It is possible that the "cottage" was commissioned by Pearl himself; in any event, it is unknown who designed the original grand but simple Four-Square Italianate structure. An interesting construction, it has wooden clapboard siding covering brick and timber walls, probably designed for fireproofing purposes. Originally raised on pilings, nestled in a five acre wooded site encompassing the southwest corner of Sanford and Central (149thStreet) avenues, the surrounding properties were likewise developed with substantial mansions. By Pearl's death, however, Flushing had changed considerably. In 1845, Flushing had become an incorporated village of a few thousand inhabitants, mostly farmers and the very wealthy who constructed their country estates there. By 1880, those boundaries had expanded considerably, and Flushing's population had dramatically increased and changed in composition. Much of the land within a few blocks of the Long Island Railroad tracks were developed with substantial housing, with a mix of commerce and industry near the old town center at Main Street an Broadway. And, although estates, farms and nurseries still made up the vast majority of the land outside of the immediate village, in 1875, the first estate subdivision in Flushing was created at Waldheim, 1000 feet to the west on part of the old Sanford estate. It was the beginning of a more permanent presence for the commuting upper-middle class, and a pre-cursor to later planned communities developed in Flushing, like Broadway-Flushing, Kissena Park and Country Club. In 1884, the Pearl house was sold by Mrs. J. D. Stedwell, one of the daughters of Charles Pearl, to one Louis Henderson Bullard, the father of Roger Harrington Bullard, who was born in 1883. Roger H. Bullard was an architect of some reknown, and designed the Oakland Country Club and Golf Course in Bayside, now occupied by Queensborough Community College (the clubhouse remains as an administrative building). He also designed numerous country seats and mansions throughout Long Island's Gold Coast in the 1920's, including the Salvage estate in Glen Head, and his own house on Shelter Rock Road in Manhasset. He is probably most well known for winning the gold medal for designing "America's Little House" in 1933. 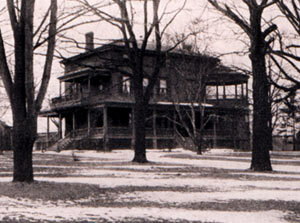 It is possible that Bullard renovated the series of complex porches which surround the mansion, as well as interior renovations, such as plumbing and gas lamps, as the original building was most likely serviced by neither. However, if he did so, he would have been in his early twenties, while he was attending Columbia's School of Architecture when design work took place. By the turn of the 20th century, Flushing had again changed dramatically. With the consolidation of New York City, vast areas of Flushing began to be developed with middle and upper-middle income developments. Across Central Avenue, now 149th Street, from the Bullard house, a significant development of single-family homes were built around 1905 - just about the time the Bullard home went up for sale. According to the D. Master & Co. real estate catalogue from c. 1905, the Bullard mansion had "About Five Acres on Sanford and Central Avenues covered with beautiful old trees. Fine large modern house, fourteen rooms, two baths, large stable and out buildings. For Sale as a whole or in plots to suit, or to rent unfurnished." The Reverend George Eccles was living in 5 Bullard Place, or 104 Ash Street no later than 1909. Eccles, who was related to the Lawrence family, who were important in the colonial history of Flushing and Bayside, was the minister of St. John's Episcopal Church, still located two blocks away on Sanford Avenue, Eccles was also heavily involved in real estate. It is probable that he divided up his five acre estate in the late 1910's due to financial difficulties. Interestingly, it is also probable that several parcels were donated by Eccles for two churches which still occupy part of the original estate: the Unitarian Universalist Church and Parsonage, located immediately to the east of the mansion; and the Lutheran Church, located at the corner of Sanford and Central Avenues. At the time of the subdivision, the mansion itself was clearly moved from its original site, approximately 150 feet to the north, on to a massive stone and cement foundation. Moving a house was quite common until after World War II in Flushing, but to move such a large structure was extremely unusual. Although all the outbuildings and stable from the original estate were destroyed in the process, almost all of the new buildings developed on the estate remain, making a small, eclectic district of single-family near-mansions, more modest homes, churches and an apartment building (constructed in the early 1930's on a former orchard behind the house , the last parcel held by the Eccles family). It is unclear why the mansion was saved by the Eccles family from demolition when the estate was subdivided. What is clear, however, is that within a decade or so of the structure being moved, there were several years in which the house was virtually abandoned. At some point, the mansion was converted into something of a rooming house, and the interior was altered to reflect that. For example, the living room was divided into two rooms, the upstairs sleeping porches, originally open air, were fitted with casement windows, and doors upstairs were replaced with smaller doors and transom windows. Although Eccles family members lived there off and on for the next 30 years, there were also unrelated boarders living there. For at least three decades, the mansion slowly deteriorated. In 1954, as Flushing was experiencing unprecedented growth after World War II, Matthew Kabriski, a contractor who had developed large parts of western Queens with rowhousing and had done steelwork renovations of the White House during the Truman administration, bought the mansion for $12,500, or $1 per square foot of the remaining land (100' x 125'). Kabriski fell in love with the mansion and instead of tearing down what at that point was a very deteriorated structure, he spent the ensuing decades restoring the building. The exterior, which had not been painted in decades, had portions of the clapboards literally warping and rotting away. Kabriski spent two full years removing and restoring as many of the clapboards as possible, and replaced rotting clapboards with replica boards. He also restored the living room close to its original appearance. There has been only one other alteration to the structure. In 1980, Kabriski installed an elevator in a small portion of the exterior back porch, barely affecting the visual - or structural - integrity of the building. The interior of the building is, like the exterior, grand but simple. Ceilings are 11' on the 1st floor, 10' on the 2nd floor and 9' on the 3rd floor. The living room is 18' x 32' with floor to ceiling windows on three sides, parquet flooring and a wooden mantle with tile on the floor. Most of the floors are oak, but the dining room flooring is pine. There are five remaining marble fireplaces throughout the house connected to three chimneys. The circular room and porch is perfectly round with some panes of original curved glass remaining. Other details from the different period renovations remain, such as the marble sinks in two of the bathrooms and the kitchen, doors and transoms on the upper floors , as well as moldings and other trim. With only one other structure from this period of time remaining in Flushing (the Windsor School, located on Sanford Avenue between Main Street and Kissena Boulevard), and the only one remaining in private hands, the Pearl / Bullard / Eccles / Kabriski mansion deserves recognition as an extremely rare example of a bygone way of life.